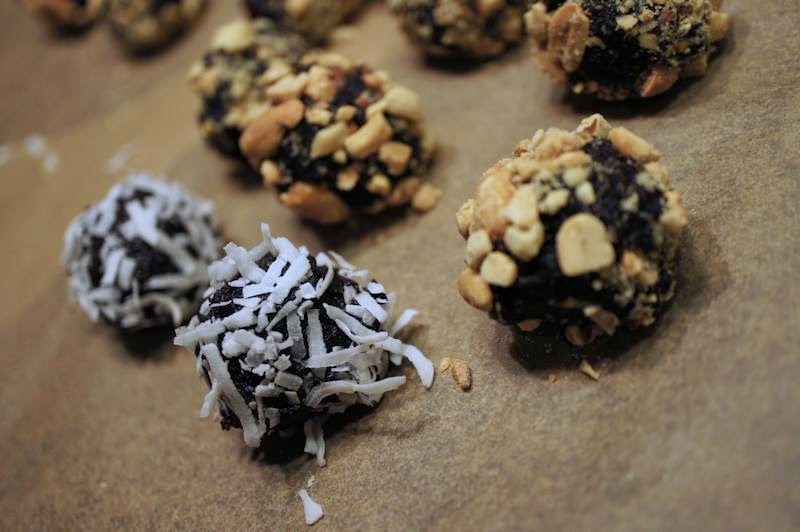 Chocolate Peanut Butter Fun Balls -- Made with all whole food ingredients! These are not super sweet, but they are divine. Place all ingredients except for the milk in a food processor fitted with the “S” blade and process until ingredients are incorporated, scraping down sides if necessary. Slowly add non-dairy milk, a little at a time until desired consistency is reached. Scoop out with 1-tablespoon cookie scoop and drop into chopped peanuts or dried coconut. Roll around in bowl to cover with topping. You can eat this immediately or chill for a firmer texture.